Instituting a paid family medical leave program in Connecticut is one of the biggest legislative pushes of the year and will be funded with a .5 percent payroll tax on all employees except state employee union members and municipal employees. According to the several bills proposed by Gov. Ned Lamont and Democratic members of the House and Senate, state employees covered by a collective bargaining agreement will be exempt from paying for or receiving the state’s paid FMLA benefits unless the bargaining unit chooses to negotiate into the program. Public-sector labor leaders have lobbied heavily over the past several years for the paid FMLA program. If unions negotiate into the program, it would allow employees to receive the FMLA benefit without losing sick or vacation time provided by the state. It could also increase the program costs for the state, according to the Office of Fiscal Analysis. Currently, public sector workers are entitled to the same FMLA leave as everyone else: 12 weeks of unpaid leave per year, during which they can utilize their sick and vacation time to cover their pay. Under the paid FMLA proposals, however, all private sector employees will pay a .5 percent tax on their income and be eligible to take up to 12 weeks of FMLA time per year with payment up to $1,000 per week or – in the case of the governor’s bill, a percentage of pay tied to the state’s minimum wage — which would be paid for out of an FMLA trust fund. Under this program, workers would retain their employer-provided sick and vacation time. According to Senate Bill 1 and House Bill 5003, which have passed out of the Labor and Public Employees Committee, unionized state employees and all municipal employees would be exempt from participation in the paid FMLA program, while non-union state employees will have to participate. In the case of municipal employees, once a municipal bargaining unit negotiates inclusion into the program, non-union employees for that municipality will automatically be included as well. The reason for excluding union members, who make up 89 percent of the state workforce, and municipal employees may be related to costs. According to the Office of Fiscal Analysis, the number of non-union state employees is minimal and does not represent any significant fiscal burden to the state, whereas inclusion of union members could drive up costs when labor contracts are renegotiated in 2022. “To the extent that otherwise excluded employees participate in the program through collective bargaining agreements, there is the potential for increased costs to the state beginning in FY 22 with the expansion of leave benefits and subject to the negotiated terms that allow them to participate in the program,” OFA wrote. According to OFA, the same potential cost increases will affect municipalities as well, as municipal employees and teachers would be able to bargain into the program and potentially drive up costs. Connecticut employers have largely fought against the paid FMLA program, making the same point – that it will drive up costs for their businesses. The program is already projected to cost the state at least $20 million to start, which would be paid through a bond, and then $18.6 million per year in administrative costs, according to OFA. But participation of state employee unions and municipal employees could drive up participation rates and costs for the state, municipalities and employees. As currently written, the FMLA payroll tax affects 1.45 million private sector employees. Government employees comprise an additional 237,000 employees, according to the Connecticut Department of Labor. The number of covered employees and the number of employees who use the program has the potential to affect the FMLA payroll tax. The payroll tax only applies to employees earnings up to $132,900, similar to Social Security. However, under the Senate and House bills this cap can be raised to ensure the FMLA fund stays solvent. The increase could only be rejected by the legislature with a three-fifths vote and would be “deemed approved” if the General Assembly does not hold a vote within 30 days after DOL submits the proposal. The governor’s bill, on the other hand, would allow the DOL commissioner to unilaterally adjust the payroll tax every year in order to ensure the fund remains solvent with 140 percent of the amount of benefits paid out the previous year. Critics have argued that the .5 percent payroll tax would quickly cause the fund to quickly go broke and necessitate increases in either the tax itself or the earnings cap. Eric Gjede, vice-president of government affairs for the Connecticut Business and Industry Association, testified the program would have an “adverse impact” on businesses and the payroll taxes will have to increase. “The amount the state intends to deduct from employee wages to pay for the program will need to be increased in the future to ensure the fund is solvent,” Gjede wrote in his testimony to the Labor Committee. Betsy Gara, executive director of the Connecticut Council of Small Towns, testified that municipalities already face a number of fiscal challenges, including reductions in state aid, increasing labor costs and “sky rocketing health insurance and pension costs,” which will impact property tax rates. “Given the fiscal challenges facing the state and municipalities, COST is taking a hard line in opposition to any new or expanded unfunded mandate which would impose additional costs on our towns and cities,” Gara wrote in her testimony. 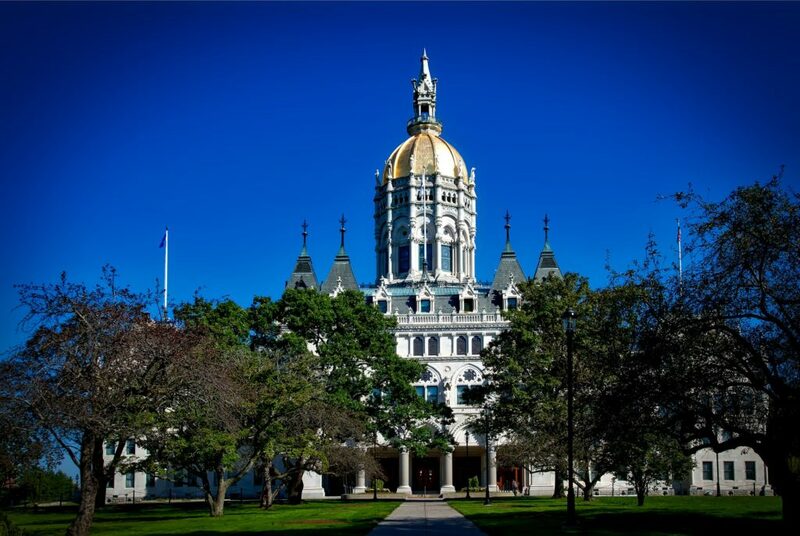 Nevertheless, the paid FMLA bills enjoy nearly unanimous support of Connecticut’s Democratic senators, representative and governor, as well as a massive backing by the state’s labor unions, including AFSCME Council 4, the CT AFL-CIO and SEIU 1199. The payroll tax would be instituted immediately, but the benefit would not become available until 2022. The bills expand the federal FMLA program and would apply to all businesses with one or more employees, rather than 75 employees under current law. So self-employed, non-W-2 employees will be exempt also I take it, as they do not collect a salary, and it would be impossible to measure withholding. That’s a lot of people also. So every January 1, 12 weeks taken off, with pay. What eligibility requirements? Physician’s note? Mental and physical treatment? We won’t say anything about the propensity of unionized workers to game any benefit system to infinity and beyond! Seriously the administrative quagmire this will create for non-unionized workers would be twice as bad in a unionized environment.